Before you even think about going vegan, you are going to need to brush up on animal protein vs plant protein to help balance your diet combining food. What is better animal protein or plant protein when dieting? When you are on a diet looking to lose weight getting through the bottom line in protein consumption may not be as simple as you've originally thought. Deciding between animal protein and non-animal protein can make it hard to decide what foods with protein to use to balance your diet. So which is it, Animal Protein versus Plant Protein? Animal proteins are proteins from animal sources such as beef, king salmon, and pig, examples of animal protein eaten daily. Although non-animal protein foods such vegetables and legumes give you the protein you need for a balanced diet, special caution that will changed the ratio of animal protein to non-animal protein in your diet. 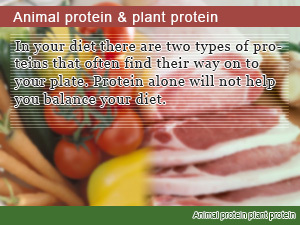 In this animal protein diet Slism, we will discuss animal protein vs plant protein going into detain on the advantages and disadvantages associated with each type of protein respectfully, following up with final words how to balance your diet in terms of protein amino acid composition through food combining. Protein including animal protein and non-animal protein such as plant protein and in particular vegetable protein is a macronutrient that your body uses as raw material to build muscle and produce blood. It is an indispensable nutrient for proper health maintenance. Most people often associate protein with building muscle. In reality that's only half the picture. The side to protein that often gets overlooked is the role it plays in your metabolism. When you lack protein in your body your basal metabolism slows down causing you to lose valuable muscles mass making it easier to put the weight you lost back on. From the top down, there are two types of proteins that come from edible food sources, which are: animal protein; and plant protein. Examples of animal protein sources include red meat and fish. For plant protein there are soy beans, and other soy products. Note that even when getting the same amount of protein, trying to get the protein in your diet only eating plant protein only beckons developing conditions caused by lack of protein. That is why finding the ratio of animal and plant protein that works for you is highly recommended. It is said that at least 20 percent of our bodies is made up of amino acids. However complicated the human body may be, there are only 20 unique amino acids that the body uses to build proteins needed by the body. These proteins are further broken down into amino acids that can be produced internally to your body Non-Essential Amino Acids and those only available through food sources Essential Amino Acids need by the body. Depending on the protein sources you are using to balance your diet, the makeup of the protein in the foods you eat may differ significantly. Although choosing a variety of different source of protein including both animal and plant sources of protein will ensure you are getting the amino acids you need to stay healthy, knowing the amino acid score in the food you eat can help you diet smarter. For example, meats and poultry including chicken, pork, and beef have an amino acid score of 100 meaning that they don't lack amino acids you need in your diet. On the other hand, foods like brown rice only have an amino acid score 68 meaning you are going to have to make up for the difference. In the case of brown rice that lacks lysine. Combining rice with soy beans gives you a complete source of amino acids in your diet. What often come to mind first when thinking about sources of animal protein are red meats, fish, dairy products, and eggs. Animal protein compared to plant protein has a better balance of amino acids that are need in a balanced diet. Due to the fact that animal protein is a complete source of amino acids, your body can metabolize it more readily than it can plant protein. 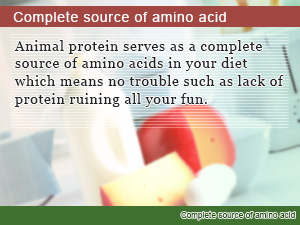 This enables you to eat less protein foods in your diet to get the amino acids your body needs to keep you healthy. Along with animal protein comes animal fat that if taken in excess is only asking for the level of bad cholesterol in your body to rise that we all know is not going to turn out healthy. For this reason, it is recommended that you supplement your diet with plant protein combinations keeping in mind the essential amino acids you are putting into your body. Plant protein foods include soy products such as soybeans, tofu, soy bean curd, and natto that are exceptional sources of high quality protein. When on a diet trying to cut back on the amount of protein in your diet you are getting from animal source, plant proteins such as soy beans are a sure solution. One of the advantages of taking in plant protein is said to be that it help you hold back on the amount of unhealthy fatty acids often found in animal protein food sources. Eating more carbohydrate foods such as rice and beans helps you cut back on harmful fatty acids in your diet. No plant protein alone is a complete source of amino acids. That is why when getting protein from plant food sources, the key to making your diet work is smart food combining compensating in areas on food lacks in amino acids such as lysine and threonine with another food giving you a complete source of protein. Getting A 1 to 1 Ratio Of Animal Protein To Plant Protein Is Key! When just getting started on a diet, most people start by reducing the animal protein food source in their diet while starting to eat more fruits and vegetables. What often gets overlooked is the fact that trying to carry out a balanced diet only on plant protein food sources can be difficult. The secret to making your protein diet work is to get the protein your body need from a vast variety of food sources always keeping in mind what amino acids you may want to look into and make adjustments to your diet as soon as you can. At this point you may want to stop eating animal protein food sources. However, don't forget that there is more to the amino acid make up you are getting from the foods in your diet. Give up on animal protein would mean that you would have to quite eaten omega-3 rich foods such as the brain food salmon. How do you know if you’re getting enough protein in your diet? Learn how to gauge the protein you are putting in your body by knowing what the labels don’t tell you its amino acid score. Never forget the importance of protein in weight loss. To support a healthy metabolism you need to be getting enough protein in your diet to lose weight the right way. What’s the 5 factor diet? Is it for me?? If you want to lose weight without feeling you have to quit everyday, yes! Balance the foods you eat with high quality proteins and low-gi foods to take it home. Get in on protein weight loss taking up the protein shake diet to cut back on calories without having to give up on optimal nutrition that gets results. In your diet there are two types of proteins that often find their way on to your plate. Protein alone will not help you balance your diet. Animal protein serves as a complete source of amino acids in your diet which means no trouble such as lack of protein ruining all your fun. 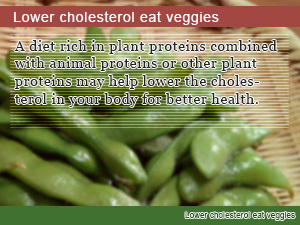 A diet rich in plant proteins combined with animal proteins or other plant proteins may help lower the cholesterol in your body for better health.